Scooper - Technology News: The previous industrial revolutions broke the environment. Can the current one fix it? We live in a world that was largely shaped by industrialists, but which is increasingly being transformed by technologists. Innovations are getting faster and more efficient, technology is becoming more and more interconnected, and we are starting to see a merging of our digital and physical realms. This is the Fourth Industrial Revolution. For the majority of people, the first three industrial revolutions happened to them. They had little say or influence. Now, at the onset of the Fourth Industrial Revolution, seems like a good time to ask if we are repeating the mistakes of the past and allowing this revolution to happen to us, or if we are deliberately shaping it to create the future we want? This is not just a philosophical question, it is a pragmatic one. Innovations in areas like artificial intelligence, synthetic biology, and the internet of things will redesign many areas of our lives. A lot of attention has been paid to how it will disrupt and change the jobs available to us, our transportation systems, and the way we produce and consume goods and services. It could also disrupt our approach to the natural world. The first three industrial revolutions led to many of our current environmental problems. Unsafe levels of air pollution for 92% of the world’s population, climate change, the depletion of fishing stocks, toxins in rivers and soils, overflowing levels of waste on land and in the ocean, and deforestation can all be traced to industrialization. We now have a unique opportunity to harness the Fourth Industrial Revolution to help fix environmental issues and to redesign how we manage our shared global environment. 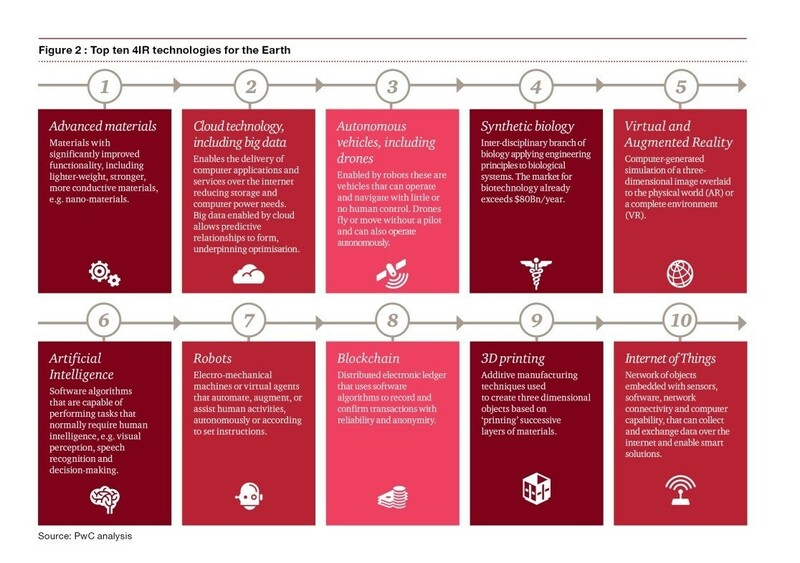 A PwC report released in January identified a list of the top 10 technologies that have the ability to address Earth challenges. Tangible examples of how these technologies can help solve our environmental problems are already emerging. Energy-Blockchain Labs and IBM have created a blockchain-based platform managing green assets like carbon credits, which is being used by the market in China. Others have suggested that one day blockchain technology could enable a global carbon market enabling individuals with low carbon footprints to sell their pollution rights to higher polluters. Drones are being used to help monitor changes in local environments , track poachers and illegal loggers, improve agricultural techniques, support maintenance of renewable energy, and assist in recovery efforts from natural disasters. As drones are increasingly connected to big data and automated management systems (from irrigation to buildings to energy production) the potential environmental benefits will grow further. Advanced satellite technology is also changing the face of earth observation and environmental management. In the last three months, not only did Google Earth receive a facelift but the NASA – GOES 16 satellite also sent its first images to earth and start-up Planet Labs (which recently acquired Google’s satellite imaging unit) launched 88 nano satellites that together will provide a full earth image every day at resolutions of around 5 metres. Meanwhile, Digital Globe’s latest satellite can provide imagery at 30cm resolutions every 4-5 days. As the resolution and frequency of images increases and is connected with new AI systems, remote sensing, and big data, we will be able to better monitor everything from land-use change, groundwater availability, and wildlife movements through to traffic system efficiency. Apps and platforms like Global Fishing Watch and Global Forest Watch are also enabling anyone with a smartphone in their pocket to be a part of the global system of environmental management. The sky is the limit, literally. The opportunities are exciting and immense, but the risks from mismanagement are also significant. In a world where data is the new oil , one of the biggest questions will be who owns and manages the data? For example, is data captured by drones or satellites owned by the company that launched the satellite, the one that manufactured the sensors, the one that controls the database, the owner of the phone app on which the user accesses the information, the government agency that part-funded the venture, or the farmer who launched the drone above their land? Can environmental data be ‘democratized’ so that it is owned by none but available to all? Are there viable financing and operating models to make this possible? Can we even agree on what constitutes ‘environmental data’ in the first place? These are complex questions. A second risk is that new technologies are used to accelerate the damage to our environment, not fix it. Smart sensors, enhanced satellite imagery, big data analytics, and drone ships could be used to accelerate the speed and scale of illegal fishing, which already represents a theft of about 26 million tonnes, or $23 billion a year. This is not just about fish, but about people. Around 1 billion people are estimated to rely on fish as a critical source of dietary protein, while around 200 million are employed directly or indirectly in fish and seafood industries. Lastly, technology development hubs like Silicon Valley risk becoming isolated bubbles where the primary drivers of technology R&D become the markets or the technology itself. In other words, developers are either trying to cash-in, or they want to push the boundaries of what is possible, just because they can. Like in the earlier industrial revolutions, the funding models often reinforce these drivers, leaving little room for the development of public good technologies. Ironically, the internet itself was the ultimate public good technology – a true ‘game-changer’ that spurned whole new business models, services, and industries, along with improved productivity and efficiency. To manage these risks and successfully harnessing the innovations of the fourth industrial revolution for the good of the environment, we need a new, more inclusive, and more deliberate approach. Environmental experts understand the problems. Technology developers have a strong grasp of what is technologically possible. While funders, governments, and civil society will define the ‘enabling environment’ that could see such innovations succeed or fail. Some innovations that benefit the environment will have strong commercial appeal; others will be in the public interest and will turn out to be public goods (like the internet). We need funding approaches, incubators, accelerators, and mindsets that support a variety of models to thrive. Designing and building this new cannot be left to any one group, or it risks being distorted by their biases and either choking progress or delivering its benefits only to a narrow few. The World Economic Forum, in partnership with the Stanford Woods Institute for the Environment, PwC, and the Mava Foundation, has launched a new initiative to fill this gap. We are inviting interested parties to contribute to this conversation and help create a new operating system for the environment. We are hosting a series of dialogues (face-to-face and online), producing a series of insight reports that map Fourth Industrial Revolution innovations (from idea to late-stage) against the world’s biggest environmental issues, and offering our new Centre for the Fourth Industrial Revolution in San Francisco as a focal point for stakeholders who are interested in shaping this future by design, not by accident. As part of the initiative, we are also building an accelerator platform where these conversations can be turned into tangible and inclusive collaborations that help scale innovations and ensure that the Fourth Industrial Revolution is good for our planet and its people, not just the robots.